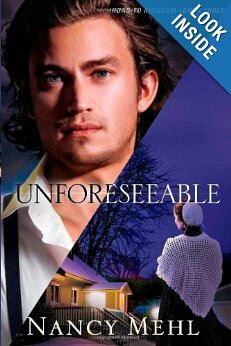 I have read the first two books in the Road to Kingdom series by Nancy Mehl, so when I had the opportunity to read and review the latest book, Unforeseeable, I was thrilled. Callie Hoffman’s life is all falling into place in Kingdom. She loves working in the local restaurant with her friend, LIzzie and is engaged to the love of her life, Levi, the new pastor. However, when a body is discovered just outside of Kingdom that is connected to a serial killer, things begin to spiral out of control. Will this mystery bring more questions than answers? Is there some connection between the case and Cassie? Will Callie’s search for answers put her engagement and life in jeopardy? Nancy takes the reader back to the delightful, secluded town of Kingdom. There are several familiar characters as well as a few new ones. It is not necessary to read the first two books before jumping into the series. However, once you have read one, you will want to read the others. Like Nancy’s other Road to Kingdom books, I would highly recommend, Unforeseeable. It keeps you on the edge of your seat from start to finish.